The main bedroom was really fun to give a makeover and it feels awesome to wake up every day to the sight of furniture that me and my Dad built together from scratch. This room has come such a long way and I have received lovely compliments on it. I am really pleased that others love it as much as I do. There wasn’t much in the way of furniture in this room and the magnolia walls were a little bare. We decided not to keep the bed as we thought the bed that I had when I lived with my parents was much better with feature wallpaper behind it. We did decide to keep the wardrobe (which I don’t have a “before” photo of) but we painted it an eggshell black colour. The chests of drawers were brought in from my bedroom when I lived with my parents and were also painted black. Below are some photos taken some time after the initial redecoration, but the bedding was tired and the pillows misshapen. Giving the bed a new lease of life was one priority for the more recent transformation. Bedroom 1 after moving in. Bedside lights are from Dunelm. Feature wallpaper was from B&Q. I decided to keep this in the 2017 makeover. When I gave the room a makeover myself in 2017, I decided that there was way too much black in this room and I wanted something lighter to make the room feel much more bright and open. I also wanted something a bit more characterful than magnolia for the walls. 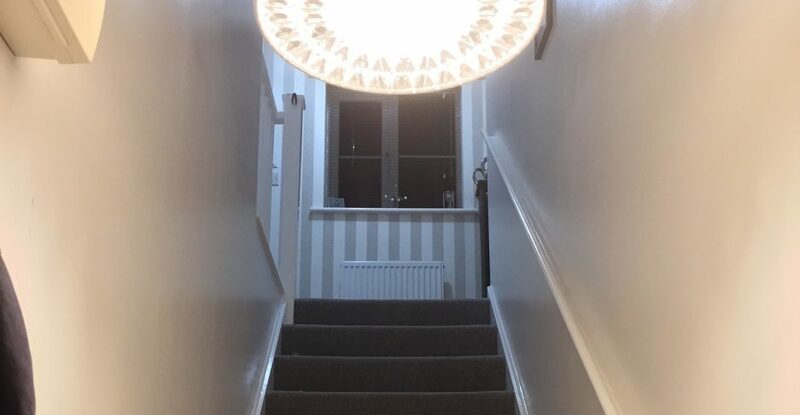 I went with two shades of grey from Dulux – Chic Shadow and Polished Pebble. This fits in much better with my love of monochrome decor and there is something so calming about it. A third Dulux colour – Rich Black, was used to touch up the surfaces either side of the bed as they had become quite chipped with use. A quick lick of paint and they were good as new! It’s quite a common thing to have a raised bit of floor in bedrooms where the stairs run underneath. If you are clever then you can make a really good feature out of these. More often than not though, they are just a pain and you have to work around them. In 2016 I bought myself a set of storage cubes from Amazon to house my ever-growing shoe collection. I had in excess of 50 pairs last year, but as part of kicking my house into shape, I downsized massively and donated a load to the local clothes bank. Below is a slideshow of the whole thing being constructed. This served me perfectly well to begin with, but in the 2017 makeover I wanted something with a bit nicer finish, so a friend offered to take this from me for a small amount of money and I set about designing my own solution. I sat down with a pencil and some paper and imagined how I wanted it to look. It took several iterations, but I eventually came up with a design I knew I’d be pleased with. I went to my local B&Q one evening after work and took this along with me. They were incredibly helpful in cutting the materials to the sizes that I needed and it only cost about £60. I used 16mm conti board to build this, purely because it was the colour that I wanted already and had a nice finish that didn’t require sanding. The storage capability of my Citroen C1 was pushed to the limit! But one weekend, my dad stopped by to help me put it all together. It was definitely a two-person job to get all the parts drilled together and to lift it into position. The finished TV wall feature loaded with shoes, bags and a few ornaments. Light box and sparkly heart ornament from Next. TV from Argos. The TV is mounted on an icing turntable, which I bought from Amazon. The idea of this is that you swivel the TV to access the DVD slot on the side or to plug extra things in to the back. The TV can be turned to access the DVD slot. The finishing touch – the bottom compartments light up! This was a set of remote-controlled LED cupboard lights from Maplin. This is one custom piece of furniture in this room. The other is a console table. A shout out to home_sweet_home_46 for giving me this idea. I didn’t want to copy her exactly, but I couldn’t find any other legs that I liked. We spoke about before I went ahead with it and she was fine with me using the same legs, so I went ahead and built it. The top is 12mm MDF, again from B&Q, and it is painted with Dulux Jasmine White. The legs are from IKEA. These two things are by far the most popular things in my house and have had so much love, both online and in reality. It is a true pleasure to wake up every day to a TV wall feature I designed myself and built with my dad and a console table that was inspired by one of my favourite insta accounts. As for the bed, I just went with plain white sheets as you can’t go wrong with them (except for them showing every crease, ugh) and I bought some black and white stripy cushions, plus some pink furry ones, all from Next. I will get a chunky-knit bed runner from Chun-Kees in the future to go across the front. You can probably tell that I am a big fan of Next. I’m such a regular in my local store that most of the staff recognise me. They are incredibly friendly and helpful in there and they sell great clothes and homeware, plus a good place to have your lunch on a weekend when you’re out shopping. What’s not to like? How the bed looks after the more recent 2017-8 transformation. Bed sheets and cushions from Next. Lighting is Philips Hue. Finally, how could I forget my cute little chair blanket from Chun-Kees to finish? The one you can see below is the oyster colour and, unlike the one in the living room which is made of acrylic yarn, this one is made of merino wool. This feels unbelievably soft to the touch and I can’t wait to get that runner I have been swooning over for so long now. How cosy do these look? Chair blanket from Chun-Kees, in the oyster colour. If you like what you see, please do feel free to leave me a comment – you will make my day! Also, for more photos of this and other parts of the house, please do go and check out my Insta page on lauraslittlehome.